If we take a look at the recent development in cloud computing, we can easily say that the change has been tremendous. Businesses have embraced the technology with arms wide open. Amazon web services have been one of the biggest players in this market, with net revenue of more than $ 17450 million US in the year 2017 alone. Looking at these statistics, it is quite evident that businesses have realized how vital AWS can prove to be for them. As astounding as these statistics might sound, the fact of the matter is that migration to Amazon cloud services brings with it its own set of challenges. What are those challenges? We will be discussing that first, and then shall shed light on the significant benefits businesses can reap by implementing AWS cloud services. 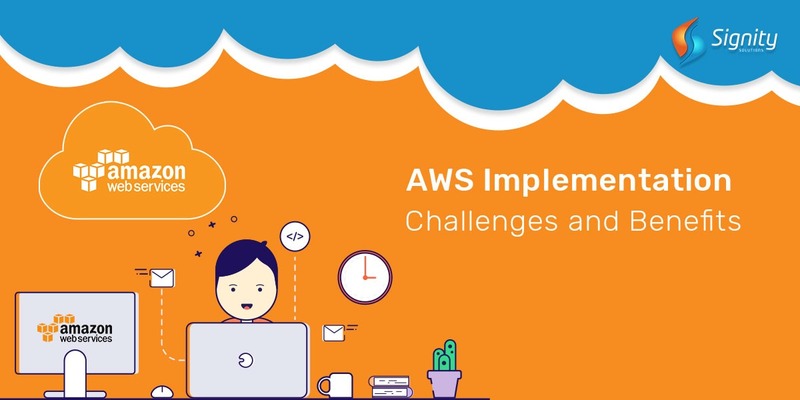 When migrating to AWS web services, the first challenge a business has to face is to make sure that the new AWS apps are in sync with the business objectives. For this to happen, you need to, first of all, identify the measurable KPIs and then evaluate the apps by them. This will help you assess the ROI and will further help you take the necessary action to make AWS migration successful. The most critical aspect of Amazon web services is the acceptance by the end users. After all, they are the ones who will be using the technology to work. Like with everything else, it is hard to bring change. To make sure that your team can accept the technology, you need to put the migration in a positive light. Make them understand the benefits AWS cloud services will bring not just for the business, but for simplifying their work life as well because without smooth on-boarding you will not be able to make AWS migration successful. Migrating your entire business data and information to altogether new technology can prove to be a massive roadblock to progress. This is where choosing the right amazon web services consultant who has the required experience and knows how to carry out smooth migration becomes the key. You cannot just go with any other service provider. Therefore, as a business owner, you need to evaluate the various service options out there and then choose the one that has the experience and expertise to carry out the job smoothly. In today’s time, data is the biggest asset for a business. And, you cannot take the security of your information lightly. A slight carelessness in handling the data during the migration process could mean you end up losing more than you could have ever expected to gain through AWS cloud computing services. To prevent this from happening, you need to figure out a few things – what type of data should you store in the cloud? How will the data be managed? At what location will the information be stored? All these questions become crucial when it comes to data security. Get all these answers from the AWS certified developer before you carry out the AWS migration to have the peace of mind. Once you evaluate all the points mentioned above, you can easily predict the ROI and profitability of AWS cloud services, which is going to be the most critical factor in your decision. After all, a smart business move is the one that brings positive ROI. Whether it is the migration to new technology or hiring a new employee, unless you can make some gain for your business from it, it won’t be considered as the right decision. Amidst all these challenges, the good thing is that migrating to the Amazon web services will empower your business with the latest technology. Not only will this boost up the speed of carrying out various processes, but it will also make sure that your team can perform more efficiently. And, that’s what matters in the end! Are you looking for the right partner to help you carry out AWS migration for your business? If that’s the case, then we at Signity Solutions, as a premier mobility service provider, is just the right partner for you. Drop us an email at info@signitysolutions.com, and we will get back to you.